New teams can be created if the System Admin has Enable Team Creation set to true in the System Console. If team creation is enabled by the System Admin, teams can be created from the team sidebar or Main Menu. The person who creates a team will automatically be given the Team Admin role for that team. 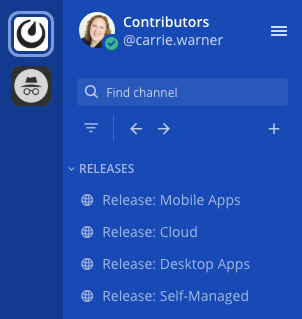 If you belong to more than one team, a team sidebar will appear left of your channel list on the left-hand sidebar. Click the “+” icon at the bottom of the team sidebar, then click Create a New Team on the team selection page, which guides you through the rest of the setup steps. If this option is not visible on the web page, then the System Admin has disabled team creation. If you have no other teams to join, clicking the “+” icon brings you directly to the team creation page if team creation is enabled. From your current Mattermost team, click on the Main Menu > Create a New Team. If this option is not visible in the menu, then the System Admin has disabled team creation. There are a few details and restrictions to consider when selecting a team name and team URL. This is the display name of your team that appears in menus and headings. It can contain any letters, numbers or symbols. It must be 2–15 characters in length. The team URL is part of the web address that navigates to your team on the system domain, https://domain.com/teamurl/. It may contain only lowercase letters, numbers and dashes. It must start with a letter and cannot end in a dash. Mattermost can be deployed both to a single team and to multiple teams. Single team deployments promote communication across the organization. When you add multiple teams, groups can become isolated. We don’t yet support search or channels across teams, which can impact the cross-team user experience. This includes general searches, flagged posts and recent mentions. Integrations (e.g., webhooks and slash commands) are only persistent across single team deployments. Teams are useful when there is a purpose for each of them. For example, one team is used for staff members and another team for external users. Performance is better when users are scattered across multiple teams instead of all in the same one. With multiple teams, there is less content to load per team or channel switch and database queries are faster. Creating a shared team for all users, and using advanced permissions to control who can create channels and add members to the shared team, improves cross-team collaboration when using multiple teams. Additionally, an annoucement banner can be used to provide system wide announcements.